On mulligan, you are trying to find either Carrion Collectors or Lurking Fear to begin discounting the Klaxions in your deck. The ideal situation you will want to have is the ability to drop a Klaxion and follow up immediately by casting Consuming Rebirth. This immediately places 6 creep tiles on the board, with the potential for 6 more. Dispels and transformative removals will stymie your game plan – but the prime objective does not change – you need Klaxion to be spreading the creep by any means possible. Ooz is also in this deck but he’s mainly a means to have an opening hand option. Not often will you find you’ll be plopping him down after 5 mana. In the meantime, you goal is to try and control the board and you have the necessary tools to do so. Standard options like Punish and Daemonic Lure are included to deal with threats. You other option is Munch which becomes incredibly potent if you’ve managed to get your creep down. Any sizeable minion your opponent puts on the board is easy to remove, and is potentially a large health swing. You will be able to fuel your draws through Nekomata and Spelljammer. There is a going to be situation where using a Consuming Rebirth will be warranted, if only to try and find a Klaxion that’s eluded you depending on the game state. Alcuin Loremaster is primarily there to generate extra removal options. There may be very rare instances where trying to get another Consuming Rebirth warranted, but you should be sticking to your removal spells. Void Pulse and Desolator are your means to stretch your health out in your quest to infest. The single copy of Desolator is to prevent poor draws from Nekomata. Additionally, you will be able to get some decent use out of Desolator if discounted enough and can be pinged with your Bloodbound Spell back into your hand. Your main win condition, if not obvious by now is Obliterate. But Ghost Azalea is included as a secondary option, as well as acting as means to remove threats. Instead of the card reuse shenanigans, it leans toward spamming Desolators as an alternate wincon, uses Abyssal Juggernaut instead of Ghost Azalea, and has a bit more early game/creep-gen with Abyssal Crawlers. Speaking of DeathsAdvocate, perhaps you picked up your spelling of Klaxon from his pronunciation? There’s no “I” in Klaxon. Dang – I’ve never noticed that there is no ‘i’ in Klaxon. Funny that DA prounounces it the same way but I had no idea he was of the same affliction. In my head at least, it sounds better linguistically. As far as his deck goes, I have to disagree with Juggernaut over Azalea because it’s a minion that can be dealt with pretty efficiently. Many factions have powerful single target removal options, and dispels completely gut the card (and mind you his deck runs EMP as well). On the other hand, you can equip Azalea and still clear a threat or bop the enemy general for immediate impact. Additionally, the issue with three copies of Desolator in this deck is that it pollutes your Dying Wish draws off of Nekomata. As Klaxon is you primary creep generator, the idea is to increase the odds of you drawing one. Sure, there is an inherent weakness in my deck in that if the Desolator is dispelled or milled, you don’t have another copy to rely on but it’s a backstop meant to give a little breathing room while you continue to splay the board with creep. 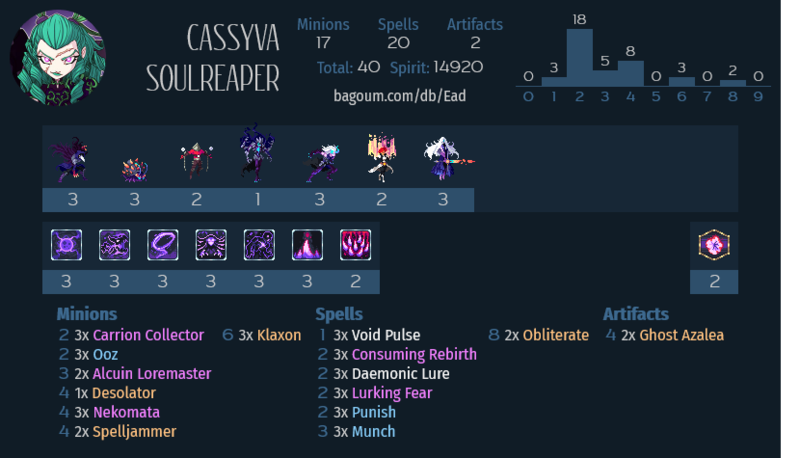 I had tinkered around with Abyssal Crawler, Sphere of Darkness, Painful Pluck and Shadow Nova as potential inclusions but found that they were inconsequential as far as getting to the win condition. You have enough tools to chip down your opponent to get them within range while still controlling the board.